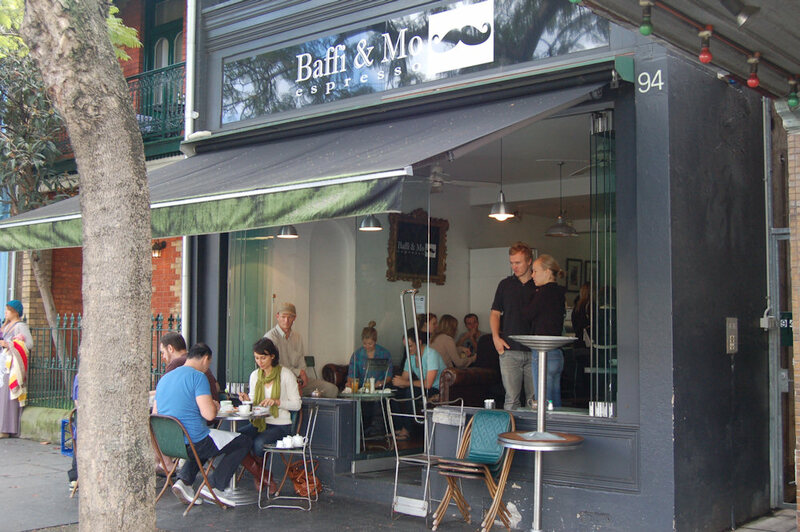 Baffi (Italian for “moustache”) & Mo (Australian for “moustache”) is located on Redfern Street close to Redfern Park. It’s small but bustling so you won’t miss it. Due to its popularity you’ll want to arrive early or be prepared to wait for a table. Newspapers are left scattered on the tables and the couches are so comfortable that once someone sits down, they’ll be there for a while! 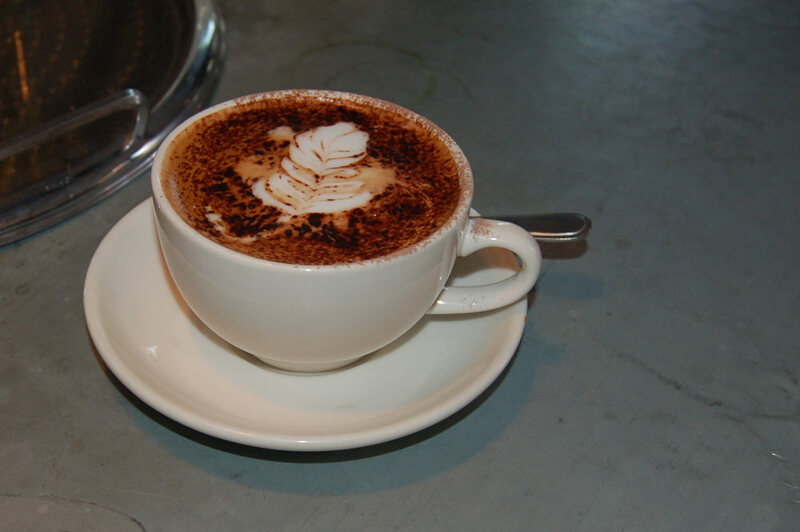 The waitstaff are calm, friendly and professional – the perfect combination for a busy café. The menu did not specify any beverages so one must assume that Baffi & Mo has all of the usuals. The hot drinks were a great introduction to an overall fantastic experience. The skim cappuccino was impressive – the coffee drinker amongst us didn’t even need to add sugar like normal but rather just enjoyed the flavour of the beans. 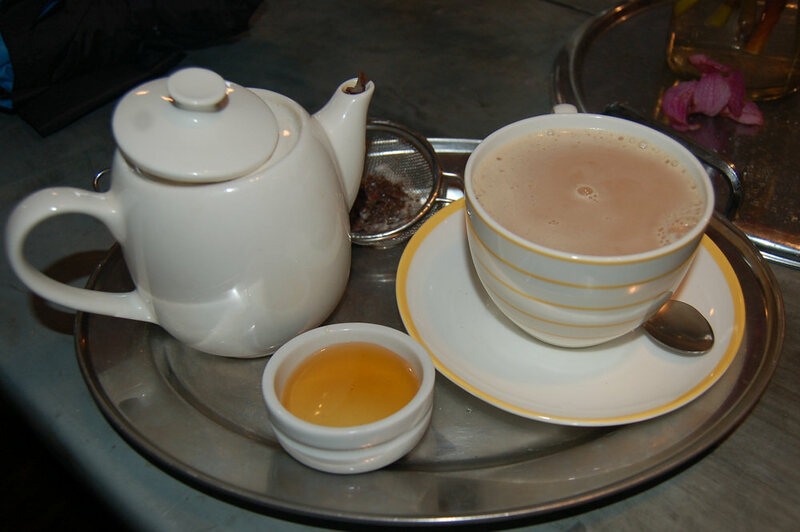 The soy chai was also a real treat. Rather than using a powered ‘chai latte’ mix Baffi and Mo offer a delicious brew of tea leaves and spices. The honey on the side adds a pleasant sweetness to the drink. The presentation was exceptional with gorgeous printed tea cups served with a miniature tea pot. 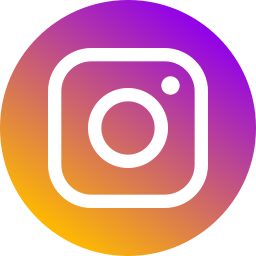 Open the image above to its full size and tell us you don’t want to go to Baffi and Mo right now! 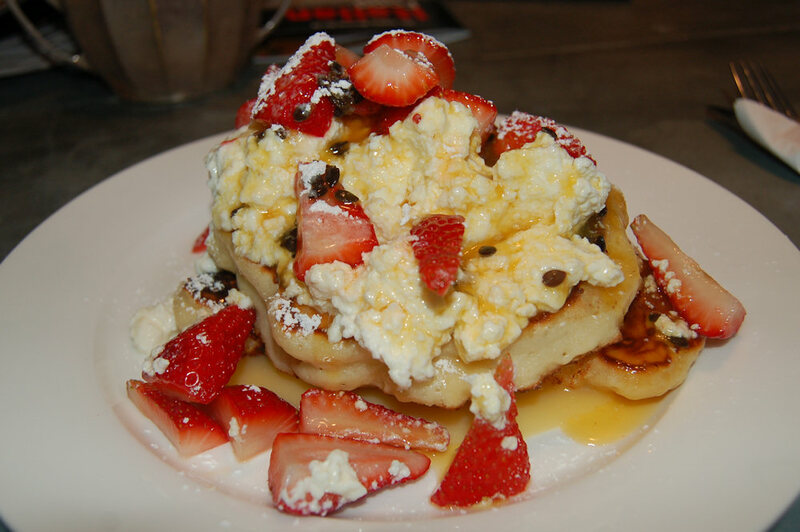 The ricotta hotcakes ($14) comes with two hotcakes topped with passionfruit ricotta. The tower is covered with fresh strawberries and then to add to the over-indulgence, a tangy lemon curd is poured around the edges. The hotcakes were delicious although slightly undercooked in places probably due to their thickness making them a little soft. The blend of flavours work very well together. The sweet strawberries help to take the edge off the lemon and passionfruit. This is a highly recommended dish if you visit but maybe share with someone who orders something savoury to avoid a sugar overload! The poached (or scrambled) eggs with country white sourdough toast ($9) was ordered with a side of bacon and avocado ($3 each). Simple yet prepared and served with experience. 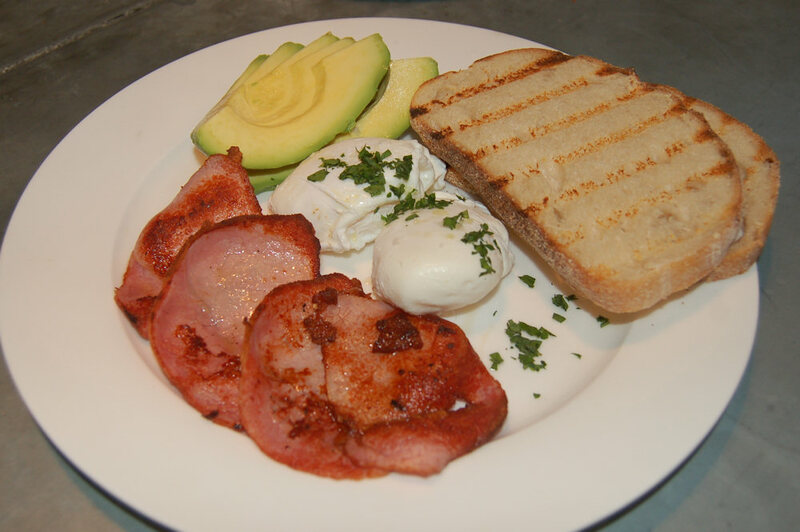 Nothing was over or under cooked, the avocado was fresh and spread easily, the eggs were neat and the bacon consisted of clean, rindless cuts. But where’s the butter? 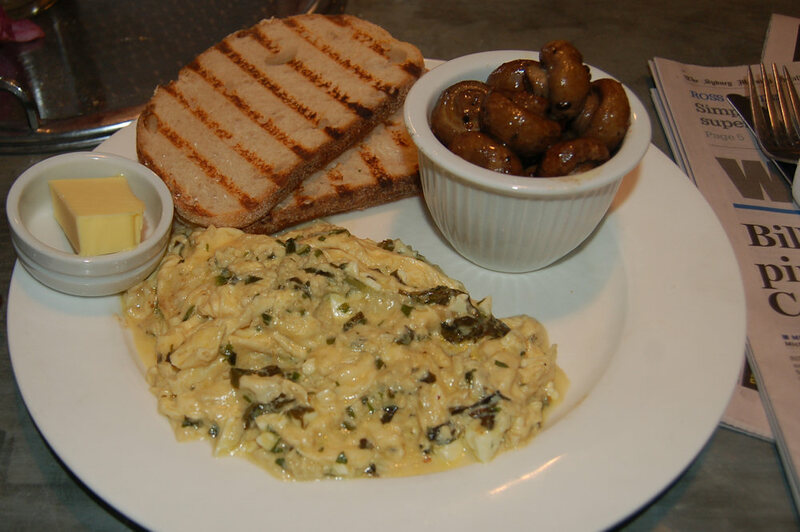 The pesto and fetta scrambled eggs ($12) is served with sourdough toast. I asked for a side of mushrooms ($3). The mushrooms were succulent, fragrant and my favourite! The eggs were cooked to a good consistency of firm yet runny in places and the combination of pesto (mainly basil) and feta worked well. The toast was sliced slightly thinner than normal which was great because it allowed more room for egg and mushroom on the fork. During a conversation with two locals they stressed the great efforts the staff take to supply fresh and seasonal produce. If you’re an early riser head down to the Eveleigh Farmers’ Market and pick up some fresh produce before breakfast. They’re located just a few minutes drive from the café. Even if you sleep in and have a late breakfast at Baffi and Mo, be sure to pop in to the markets on your way home (but all the best produce will be gone).